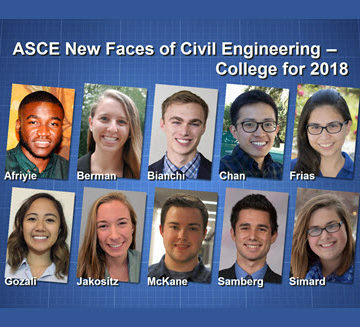 Each year, ASCE recognizes 10 college students who represent the future of civil engineering. These New Faces of Civil Engineering are the rising stars of the industry, role models for the next generation of civil engineers. One student created an app to help others find on-campus parking spots. Another interned on an island in the Gulf of Maine at Shoals Marine Laboratory. Another student created a space on campus for students to make their ideas a reality through brainstorming, planning, and prototyping projects. With remarkable achievements, academic accomplishments, and commitment to serving others, these students are on the way to greatness as they continue to pursue civil engineering. Afriyie has worked as a project engineering intern with Balfour Beatty. He contributed to the Fenton Street project in Silver Spring, MD, giving him a behind-the-scenes look at the construction industry. He learned about submittal packages, change orders, requests for information, and legal proceedings related to construction. The internship inspired him to pursue green and sustainable infrastructure in his studies. Afriyie is also project manager of Morgan State’s Ideation Space Project. In that role, he helped create a space on campus where students could make their ideas a reality. This project gives students a place to brainstorm, plan, and prototype projects. Afriyie continues to promote civil engineering through his involvement with the MSU ASCE Student Chapter and as financial director for the school’s concrete canoe team. He is also president of the university’s Chi Epsilon chapter. A leader in civil engineering at her university, Berman is involved in many civil engineering programs and organizations at Penn State, including Bridges to Prosperity, for which she has served as university program ambassador, travel team member, fundraising captain, and project manager. She is a mentor program officer and member of the Career Fair Committee with the Penn State ASCE Student Chapter. Berman also serves as a career envoy, mentoring peers who are searching for internships or jobs. Berman is also a member of the Civil and Environmental Engineering Alumni Society Board of Directors, the Traffic Bowl team, and the Institute of Transportation Engineers. She was previously a member of the university’s Women in Engineering Program and the Traffic Control Device Challenge team. Bianchi is a teaching and research assistant, Civil Engineering Department ambassador, and member of his university’s Earthquake Engineering Research Institute at Virginia Tech. Bringing his interests in problem solving and civil engineering together, he worked with students from various programs – geography, computer science, electrical and mechanical engineers, and more – to create a mobile app to make finding parking spots easier for students. He is also the co-founder and president of Paradigm Campus Innovations, a startup that brings simple software solutions to college campuses. Bianchi’s work experience includes his time as a structural buildings intern in the New York City office of Dewberry, an engineering consultancy where he worked on a project designing resilient solutions to floods. He also interned with MPR in Alexandria, VA, learning about the nuclear and power industry. Chan is president of the University of Toronto’s American Society of Heating, Refrigerating and Air-Conditioning Engineers Student Branch and a mentor for the school’s civil engineering club. Previously, he spent two years serving as the youth representative for the York Region Water Conservation Advisory Committee, was involved with the Canada professional and student chapters for Engineers Without Borders, and worked on the UT concrete canoe team. Chan’s work experience includes an internship with Walter P Moore & Associates, where he contributed to projects in structural and building enclosure diagnostics. As an intern, his two main tasks were reviewing drawings for design issues that would affect building performance and monitoring construction. Frias was inspired to become an engineer in seventh grade after attending a STEM-focused summer camp. Her interest in civil engineering was confirmed in eighth grade, when her family moved to a new house. As a student, Frias has been involved in various UTA programs and organizations, including serving as the ASCE Student Chapter president, concrete canoe design sub-captain, and historian. She is also a member of the Engineering Student Council and was named Ms. Engineer in 2017. Frias’ mentor, James Williams, encouraged her to pursue civil engineering, and his passion for maps and roads influenced her to focus on the transportation industry. Through her land development internship, Frias worked closely with many professional engineers, who taught her how to use creative approaches and critical thinking. Gozali’s parents immigrated to the United States from Indonesia, and throughout her life her family made several visits to the port city her parents previously lived in. During these visits, Gozali saw firsthand the effects of poor water quality. It was these visits that inspired her to become a civil engineer. At Santa Clara, Gozali has been involved in various programs and organizations, including SCU’s ASCE Student Chapter, which she served as president. She was also part of the team that placed in the KEEN Innovative Engineering Art Challenge and is involved in SCU’s Spring Engineering Education Days. In 2016, Gozali was selected for the Jean Donovan Summer Fellowship. She volunteered in Buenos Aires, Argentina, working on a joint project between two nongovernmental organizations. Through this unique opportunity, Gozali pursued her interest in civil engineering as well as her passion for social justice. Following the Fellowship, she is partnering with the Buturi Project for her senior capstone project. The project will focus on implementing a rainwater catchment and purification system in the Makongoro Village of Tanzania. Jakositz has been active in the UNH Environmental and Water Resources Institute Student Chapter, which spurred interest in other extracurriculars, including UNH STEMbassadors, a hands-on STEM education program for elementary school students, and four university-sponsored research projects. She is also president of the UNH chapter of Tau Beta Pi engineering honor society. Jakositz was a sustainable engineering intern with Shoals Marine Laboratory on Appledore Island in the Gulf of Maine, where she designed and evaluated a rooftop water-collection system, analyzed groundwater supply, and researched the island’s solar power generation. Jakositz’s studies and work have taken her across the globe. As a Hugh O’Brian Youth Leadership Foundation Alumni, she traveled to the Dominican Republic on an international service trip. She also studied abroad in New Zealand and has since been a volunteer in UNH’s study abroad office as a global ambassador. McKane’s work experience includes an engineering internship with the Camden County Municipal Utilities Authority, a wastewater utility serving over 510,000 people. As an intern, he visited construction job sites, researched the water treatment process and various ongoing projects, and surveyed pipelines in the field. McKane is the events chair for Rowan’s ASCE Student Chapter, and he is an active member of the Rowan Environmental Action League, the U.S. Green Building Council, and the American Society of Highway Engineers Student Chapter. McKane is also an Eagle Scout and member of the Boy Scouts of America, through which he volunteered for over 200 hours and worked to restore a veteran’s memorial at a local cemetery. Samberg has worked as an intern with the Stellar Group, a design-build firm in Jacksonville, FL, that specializes in commercial construction projects. As an intern, he went behind the scenes of $7-$10 million projects and learned how a contractor successfully estimates a project’s constructability from its initial concept to its final delivery. He has also worked with Habitat for Humanity to construct family housing and gained hands-on experience on project work sites. At Florida Tech, Samberg is secretary of Associated Builders and Contractors and has held positions as concrete canoe captain and as a small teams manager for the ASCE Student Chapter. “I am excited about finally being able to work on innovative and interesting projects that benefit the community and being able to apply the knowledge and skills I’ve accrued over the course of my college career in a professional setting with others who are just as goal oriented as I am,” Samberg said. Samberg is also president of the Florida Tech Triathlon Club, a member of Student Organization for Sustainable Action, and was previously a member of the Florida Tech men’s rowing team. Simard serves as president of the UMass Lowell ASCE Student Chapter. She is also secretary of Chi Epsilon civil engineering honor society, and a member of Tau Beta Pi engineering honor society. As an intern with National Grid’s Gas Engineering Department, Simard enjoyed the opportunity to apply her classroom knowledge in the field. Her internship focused heavily on safety, and she learned the importance of ensuring safety for the company’s customers, as well as the employees. Simard is also a member of Tau Sigma national transfer honor society and Omicron Delta Kappa national leadership honor society. 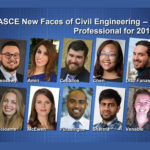 Meet ASCE’s 2018 New Faces of Civil Engineering – Professional.